Take a new look at toile, the traditional fabric that designers are revising with verve. First, a mini-history lesson. Originating in 18th-century Ireland, toile de Jouy (named after a French town) is a traditional fabric once reserved for window treatments or upholstery. Historically, the fabric featured monochromatic pastoral etchings in a repeated pattern against a cream or white background. Reaching the height of its American popularity during the Colonial Era, toile has at times been considered outdated, stuffy, and so not chic. Well, a new style era has dawned, and toile is once more ready for its close-up. Technology now allows artists to create highly unique, colorful, and personal patterns that blow the stuffy old designs out of the water. Even renowned decorator Charles Faudree couldn’t keep two of his loves—King Charles spaniels and everything French—separate for long, designing his own doggy-themed toile for Vervain called Cavalier Toile. With a lasting style that has become so customizable, toile is here to stay. In this master suite, blue-and-white toile fabric by Hinson & Company was used for wall coverings, bedding, and furniture, creating a peaceful mood. The upholstered headboard is illuminated by sconces from Circa Lighting and accented by a painted wood arch. A blue-and-white needlepoint rug by Stark Carpet introduces a simple grid design underfoot. In this guest room, toile encloses the bed niche with a contrasting black-and-ivory pattern. Coordinating gingham graces the headboard and lines the bed curtains. A large clock, once mounted on a public building, reflects the fabric’s hues. A woven grass rug and tiled flooring underneath add texture to the space. Fit for a princess, this guest suite features walls upholstered in a luscious lavender-and-lime toile that is repeated on the bed curtains. Lilac details throughout the rest of the room carry the toile’s hue while incorporating some shimmer and sheen, like the satiny pillows and bedside table. Designer Joan Peters couldn’t find just the right toile pattern for this Massachusetts showhouse guest bedroom, so she designed it herself. The pretty blue-and-white pattern depicts 48 icons of the Massachusetts peninsula, including the Provincetown Monument, lighthouses, and beach dunes. Toile can also be used as an accent piece rather than the main event. This master bedroom is “a complete retreat,” says designer Eric Cohler. Walls and headboard, both covered in chocolate-brown fabric, blend together, leaving room to ramp up the contrast with creamy bed linens. Custom demilune bedside cabinets with shagreen inserts and mercury-glass tops add a bit of contemporary glamour. Cocooned in green toile, this retreat has rustic charm and color to spare. The pattern covers the walls throughout and extends down to the matching bedskirt. Adding a dose of blue and white keeps the colors from becoming too saturated. Toiles are monochromatic no more. An Asian-themed wall covering from Stark sets the stage for a lively mix of fabrics and patterns. The rug is from Michaelian & Kohlberg. Designer Mary Douglas Drysdale decked out this spare bedroom in intense blue-and-white toile. Reversed from its traditional white backdrop, this fabric breaks the rules and encases the space as the bed cover, bed curtains, and wall covering. Cream and chocolate tonal patterns dominate this space. Classic toile dresses the windows, while a damask weave by Scalamandré adorns the bed, creating movement in an otherwise quiet room. A vibrant toile of acid-green and red livens up the upholstered footboards, bed linens, and lofty window curtains in this Chicago teen’s room. Bold colors update the modest pattern with a twist: The toile itself is sweet and feminine, yet the wild palette lends pizzazz. A collection of whimsical hot air balloon prints hangs on the far wall. Twin beds allow the bedroom to double as a guest room. A space does not have to be drenched in toile to be noticed. Soothing lavender walls provide a pretty contrast to black-and-cream toile, which is used sparingly for maximum impact. Zesty yellow fabrics from Lee Jofa and Schumacher brighten a guest bedroom. An array of colors pulled from the fabric’s design appears in decorative spools of thread. Walls are painted white so as not to detract from the lively toile’s impact. In addition to the four-poster bed by Hickory Chair, a daybed under the eaves offers a cozy sleeping space. There’s no question that toile makes a decorative statement with its delicate sketch-like forms rendered on an expansive field, but usually the impact is one of softness. Designer Michael Burg emboldened that effect by covering this gentleman’s bedroom in not one but two layers of black-and-ivory toile, lined in flannel for a weighty, masculine appeal. The mohair-upholstered bed, sea grass floor covering, and glazed ceiling add texture. 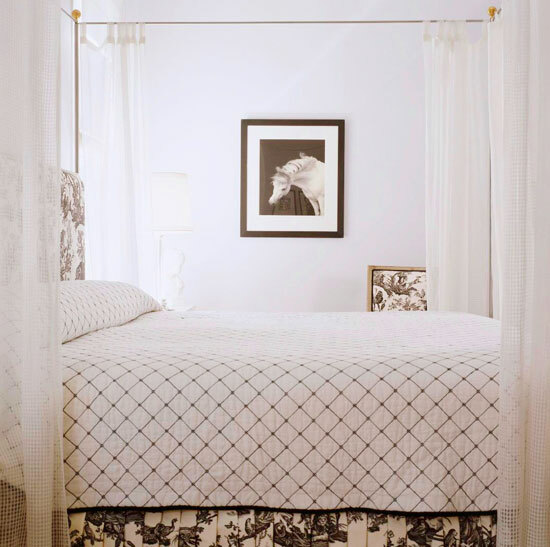 Back-and-white toile wraps this room in traditional comfort. Clean-lined bed linens, plantation shutters, and a pair of convex mirrors back up the American Colonial motif. Tall bookshelves make the space even cozier. Blue-and-white toile wraps this bedroom in soft serenity. A toile ceiling-mounted crown lined in a coordinating print surrounds the tufted toile-covered headboard. The sprig of mistletoe hanging over the bed is a traditional nod to the holidays. Here soothing toile extends to the bedroom’s cozy seating area, with window treatments obediently following suit. To add a bit of unexpected variety, the floor is covered in playful leopard print carpet. The wild lime green palette of this bedroom is a humorous twist on the bygone formality that toile used to represent. Here, the only conventional detail is the straight-laced bedside table. Four different patterns play in blue and white in this master bedroom. Toile is used at the headboard, balanced by clean lines on the checked bedspread and plaid bolster pillow. Setting boundaries with a simple color palette helps to keep the various patterns from appearing too busy. Can’t get enough toile? Click here to see our presentation of Toile Decorating Ideas for the rest of the home.